President Muhammadu Buhari has described the passing away of South-African anti-apartheid icon, Mrs Winnie Madikizela-Mandela as a huge loss to Africa. 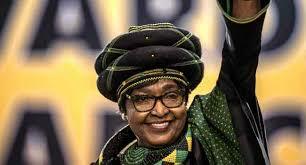 The President, in a statement by his Senior Special Assistant on Media and Publicity, Garba Shehu, noted that Winnie Mandela was “a woman of uncommon determination, steadfastness and perseverance who held aloft the torch of the struggle against institutionalised discrimination even while her ex-husband, the late Madiba, President Nelson Mandela was incarcerated. He urged the South Africans to be consoled by the knowledge that the late Winnie Mandela’s contributions to ending apartheid will not be forgotten. According to him, she remained a pride not only to the African woman, but indeed all Africans. The President prayed that God Almighty will comfort all those who mourn the departed and grant her soul eternal rest.